This year’s Montreal Audio Fest brings back memories of my first Montreal audio show in 2006. It was a 3-day road trip with 7 guys packed into my Honda Odyssey, I remember going out wining and dining every night, the next day we would attend the show half sober until we regain our full hearing abilities which usually came well after 2 pm, depending on whether it was a Napa Valley or a Bordeaux we drank the night before. 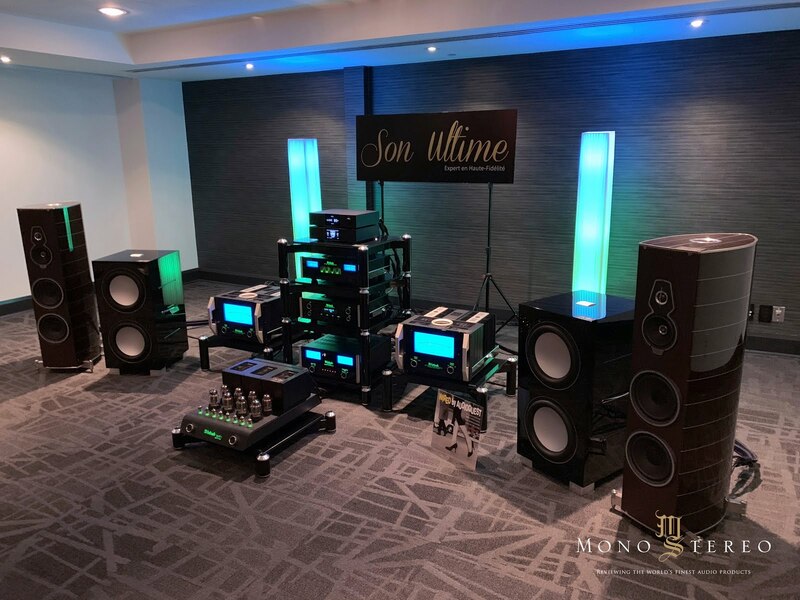 Over the years, we saw the official name of the show change from “Salon Son & Image” to the “Montreal Audio Fest”, but one thing has always remained the same, the Montreal audio show has much more than just 3 days of me wearing the “reviewer” hat, going from room to room making judgment calls on the ever elusive concept of “best sound of the show”. The Montreal show has always been about enjoying good music, good wine, good food, good equipment and good times with friends over a road trip, very much like the this year’s Woodstock theme of 1969. I treat my industry friends as brothers on a journey to the finer things in life, and Montreal road trip combined with laughter and goofiness is the culmination of all of that - i.e. to have FUN. This year’s Montreal Audio Fest has proven once again, that Sarah Tremblay and Michel Plante truly know how to put a good show together. 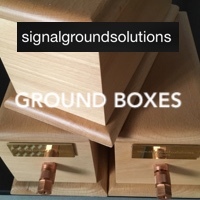 Their meticulous attending to detail, such as delivering lunch boxes to exhibitors, to laying out proper signage on the show venue, makes for a fantastic show experience to exhibitors and attendees alike. I do have a confession to make. 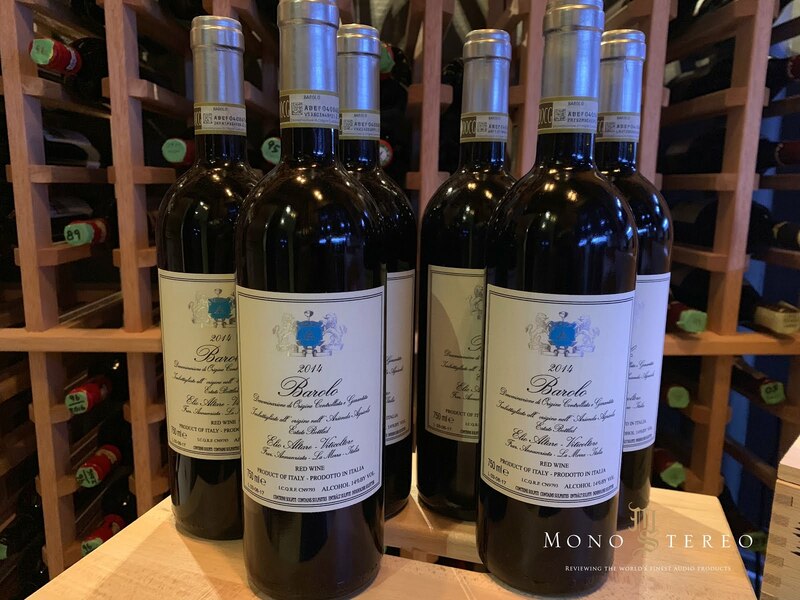 Unlike most diligent industry personnel who are up early in the morning to attend pre-show events or lining up to wait for the show to open at 11 am, I took off to the SAQ (Quebec’s provincial liquor store) to look for 6 bottles of 2014 Elio Altare Barolo. Elio Altare is made by the famed Italian winemaker who started the Barolo revolution, and to make a long story short if you see any bottles lying around just buy up whatever you can lay your hands on. They are nearly impossible to find in Toronto. There is no way I could pass up the opportunity to pick up six bottles at once, no audio gear or show report is as important is Elio Altare Barolos!! With my wines safely tucked away, and my stomach filled with a sumptuous meal of Montreal Smoke meat, the Montreal Audio Fest officially started for me on Friday at 4 pm. Mark Jones has always been a fan favorite and a "best of show" contender in both Montreal and Toronto shows for many years. He sets up his exquisite equipment meticulously and involves his audience with his picks of music during every show. Mark is one of the very few exhibitors who actually play "real music" rather than audiophile demo tracks, always taking the time to explain to the audience the music which he plays. 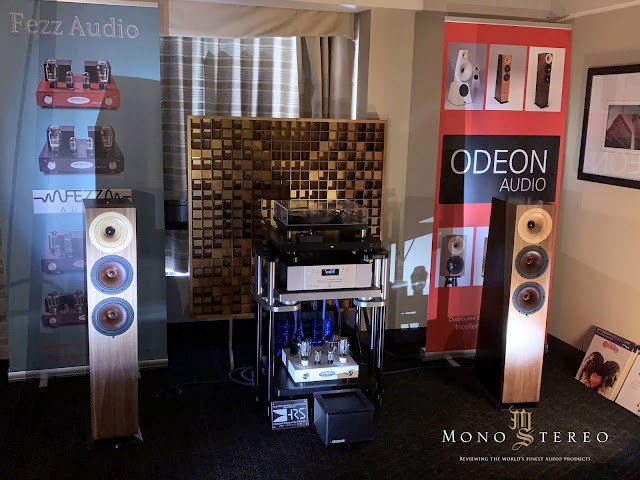 The 2019 Montreal Audiofest is no exception. 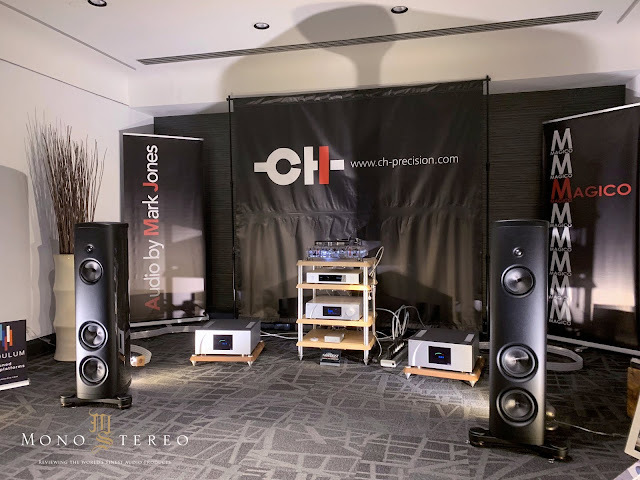 This time he proudly presents the world debut of the new Magico M2 speakers ($63,600 with MPOD stand); and the Canadian debut of a pair of CH Precision A1.5 power amps ($39,500 each) driven from the optioned phono and digital inputs of the CH I1 integrated amp ($38,000) working as a front end control hub. 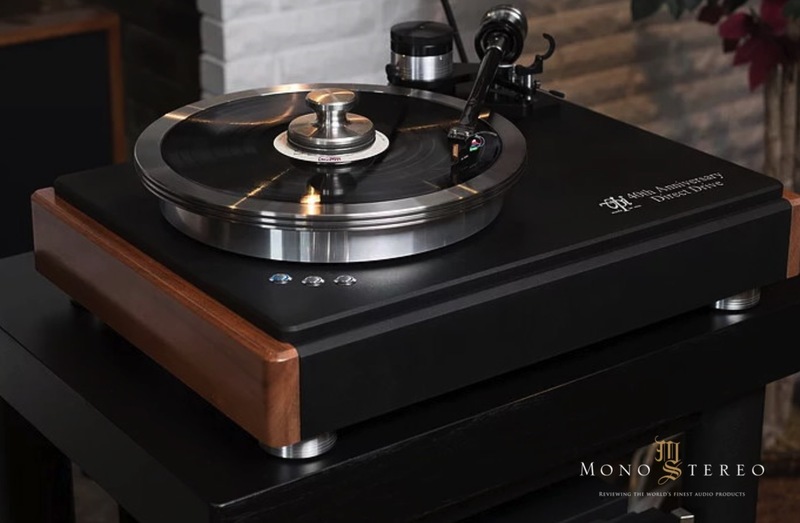 Mark also brings the visually and sonically stunning Vertere RG-1 and SG-1 turntable and arm combo ($37,200 total), showing for their first time in eastern Canada, and perfectly matching them with the Lyra Etna SL cartridge ($9,995). 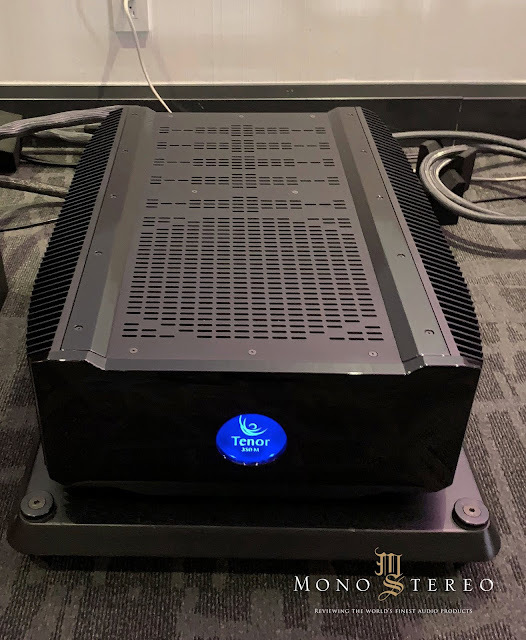 Nordost Valhalla 2 takes on the critical task of signal and AC power cable connections, with the Canadian Modulum rack and stands to add a final touch to the overall look and sound of the entire system. 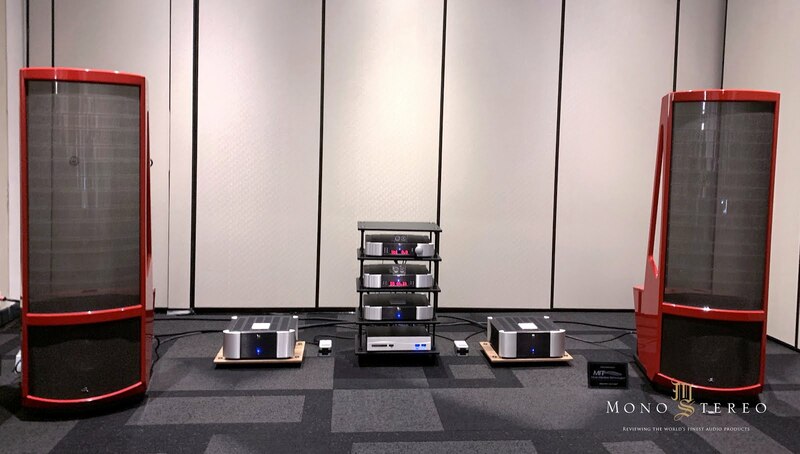 Fresh from the first production batch, the Magico M2 speakers arrived in Canada just two days before the show. The M2 is based on technology trickled down from the M6, featuring an all aluminum front baffle and rear spine sandwiching an aerospace carbon fiber chassis. 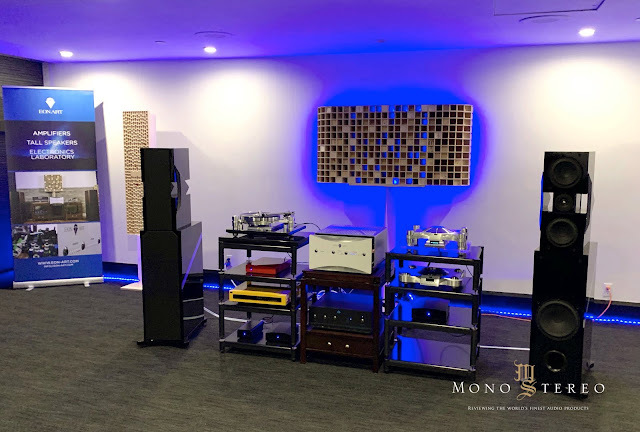 Their synergy with the CH Precision electronics started to shine through on Saturday, after just some initial breaking in on Friday, revealing the inner details, tonal accuracy, wide bandwidth, transient speed and soundstage dimensionality of the records I heard. Neil Young’s “The Way” on his Chrome Dream II album, has been brought to a new light - the system gave one of the best renderings I have ever heard. I couldn’t find my copy at home so I went on Discogs to order another, only to discover that prices have gone above $ 100 a copy. I also challenged Mark to play the song “Five Generals” from the earth-shattering soundtrack The Three Kingdoms, a monumental challenge for any system, as well as the turntable setup skills as cartridges often mistracks if the alignment is not done properly. 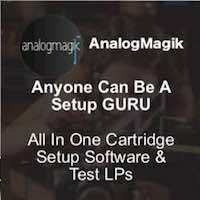 Both the M2s and Mark Jones analog skills met the challenge. The heroic battle tunes of this movie soundtrack projected a sound which appeared to be coming from much larger full-sized speakers, yet the M2s are only fitted with two 7” bass drivers. A Job was well done, considering they have barely been broken in. I left the show on Sat, but my fellow audiophile patrons told me they sounded even better on Sunday. Steve Huang, CEO, and Designer of Audio Sensibility Cables, is one of the most passionate and enthusiastic individuals I have met. From his hand gestures to his facial expression, you can tell he is very much in love with what he does. 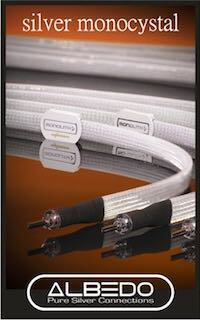 Audio Sensibilities prides itself in providing high-quality audio cables at much lower prices than his competitors. 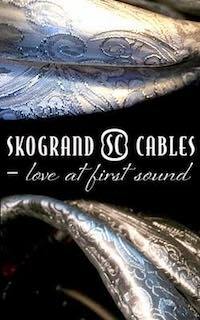 He proudly showed me the internals of his “Signature Single-Wire Speaker Cables”, which are made of bare twisted 7N 99.99999% purity rectangular Ohno Continuous Cast copper. 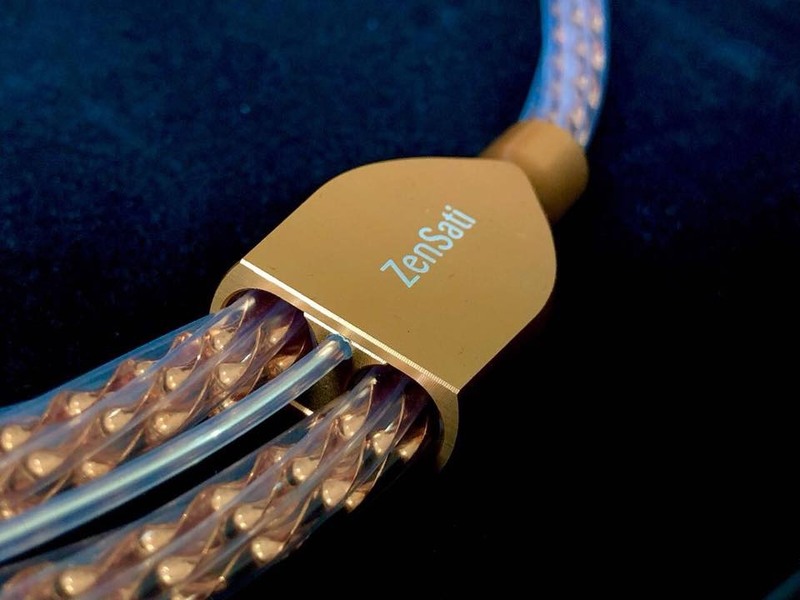 The twist construction pattern reminds me of the internals of the Zensati cables, but of course, with Huang’s cables, you can knock a Zero off of the Zensati price tag. 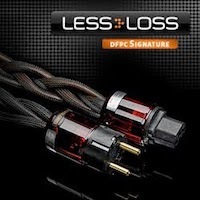 Price of this speaker cable maxes out at C$2000-3000 dollars depending on configuration. 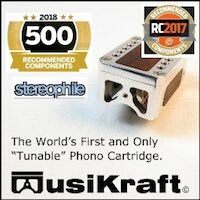 Another nifty little product I discovered is Hot Valve Audio’s “Easy VTA On The Fly” adapter for use with Jelco Tonearms (US$260). 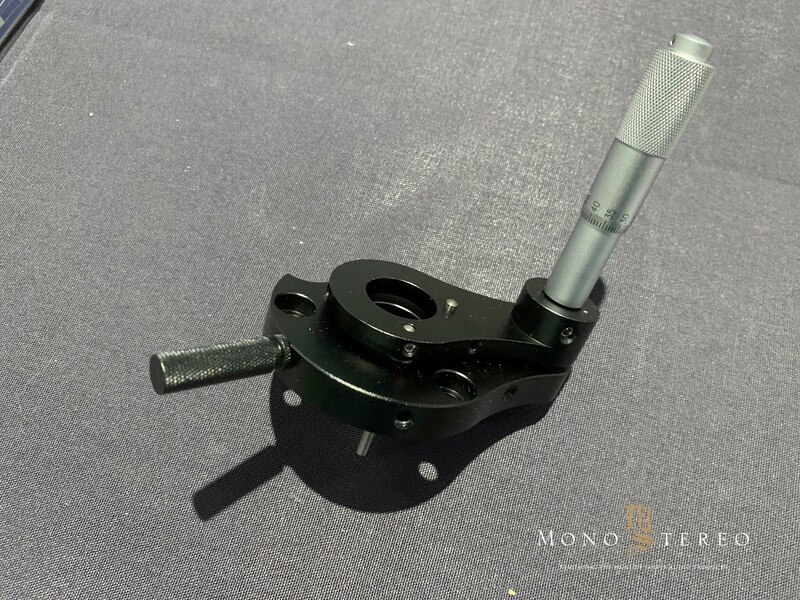 With the adapter, you can adjust VTA on the fly by turning the built in micrometer. 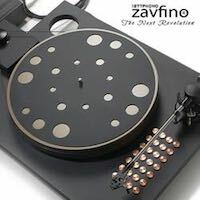 You can watch a live demo HERE, a must have adapter for Jelco Tonearms. 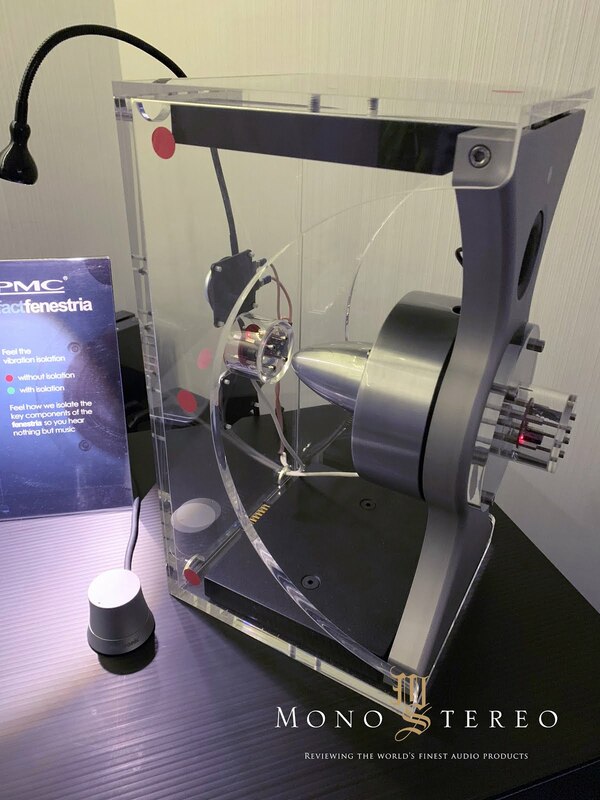 My favorite speaker of the entire show is the all-new PMC Fenestria (C$ 90,000). 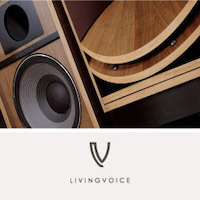 The 176 lbs speaker is housed in a cabinet nothing short of an engineering marvel. 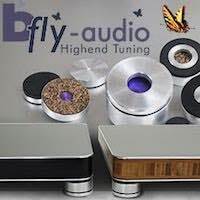 The tailor-made soft dome tweeter and the 75mm soft dome midrange driver is housed in their own module or “nest” made from a billet of solid aluminum. 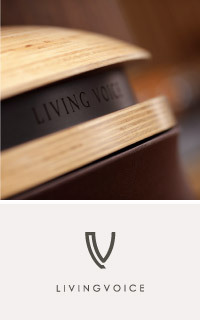 The “nest” has a specially designed integral suspension mount which almost decouples it from the rest of the cabinet. The result, according to PMC, is stable, pin-sharp imaging which will appear not to originate from the Fenestria. The wooden side panels of the Fenestra are called “Planar Wings”, and they are actually decoupled from the cabinet by use of suspension mounts. 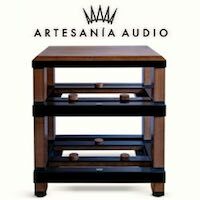 The Planar wings act as tuned mass dampers to eliminate unwanted cabinet resonance. The proof is in the pudding, and the Fenestria did not disappoint. I heard a life-like rendition of Viva La Vida by 2Cellos (Luka Šulić & Stjepan Hauser), the sound was organic, lush and full-bodied while the instrument size in exact life-like proportions. Equally satisfying was “Deeply Disturbed” by Infected Mushrooms, which goes to show the Fenestria does equally well with electronic rock. And just before I left the room, Will Young’s “Golden Slumbers” pulled me back into the room with a voice that is organic, seductive and emotionally charged. 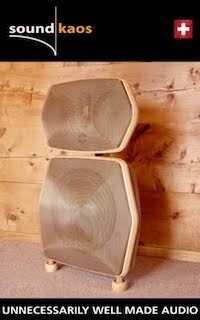 The bass notes on the PMCs carries hallmark traits of transmission line designs, sort of the opposite of the bass from say a Magico or a Wilson speaker. 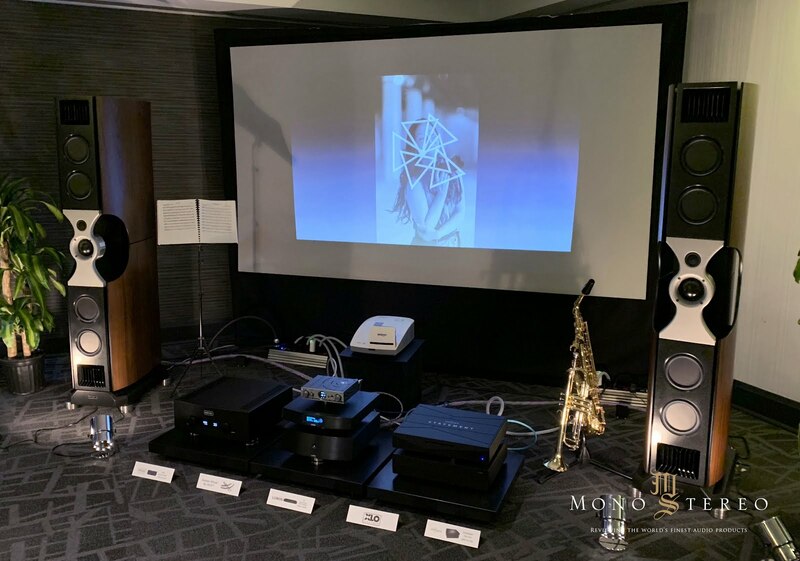 Next door to the PMC Fenestria, is the Monitor Audio / Roksan Room. 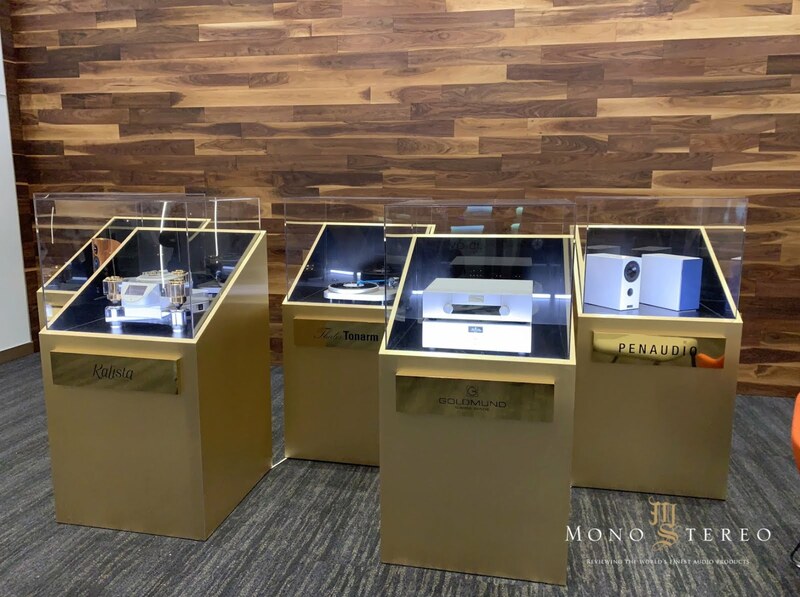 Here we found a pair of Monitor Audio Gold 300 literally at one-tenth the price of the PMC Fenestria. 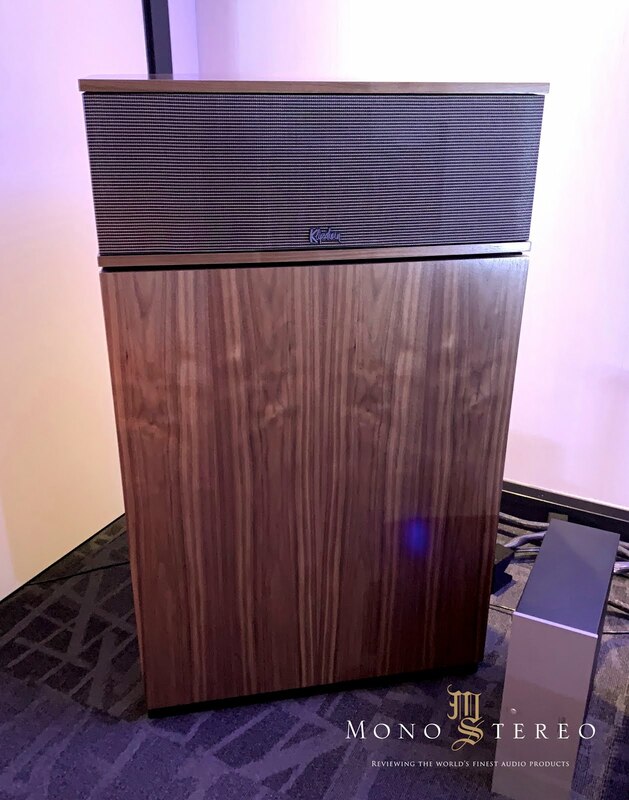 Price at $ 9000, the 3 days 90 dB sensitivity speaker houses two 8” bass woofers, a 2.5” midrange, and a ribbon-like “MPD” Micro Pleated Diaphragm Transducer. The speaker has a glossy Ebony wood finish which is elegant and timeless. 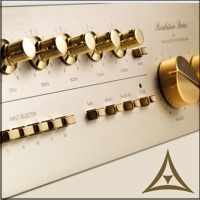 The rest of the system includes the Xerxes 20 Plus Turntable ($ 4,000 CAD), and Roksan amplifiers. 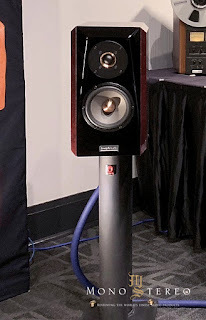 For $ 9000 MSRP they sounded pretty darn good, not that anyone would make a comparison with the $ 90,000 dollars next door. 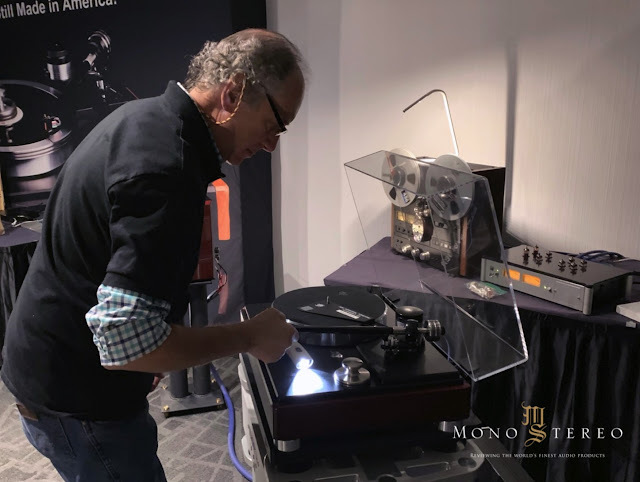 Just when we entered the VPI / Joseph Audio Room, we caught Mat and Harry Weisfeld working their cartridge alignment magic on their all-new HW-40th Anniversary Direct Drive turntable. 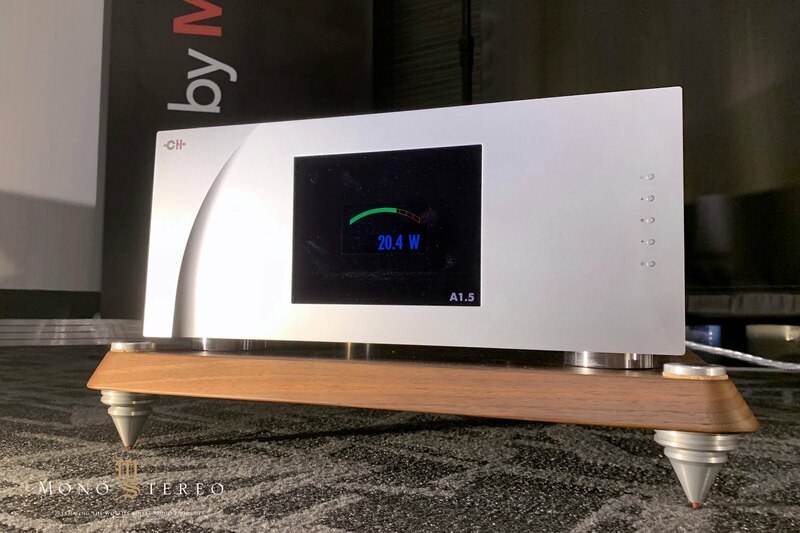 Priced at $ 15,000, the HW-40 houses a Lucent Technologies made bearing and a motor with its speed monitored by a 2,500 pulses/revolution controller. The table registers a Wow & Flutter reading of 0.004%, almost impossible to measure for non-laboratory grade equipment. The table can go from zero rpm to full speed in less than 2 seconds! The HW-40 comes with the newly improved “Fatboy” tonearm, with a choice of gimballed or uni-pivot bearings, and a fine adjustment to the counterweight mechanism. 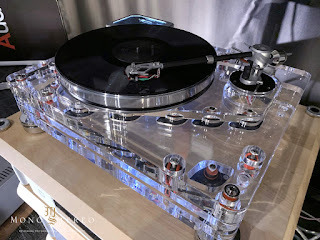 The VPI turntable was paired up with Joseph Audio’s all-new Pulsar 2 Speakers. 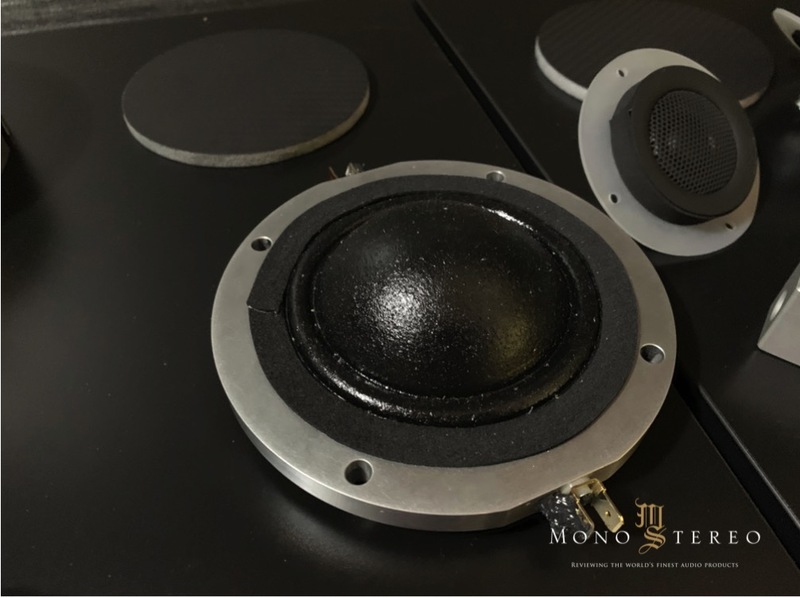 The 5.5” mid-range woofer has a layer of high purity Graphene added to the surface treatment. Graphene is a nano-material, likely one of the strongest materials tested. 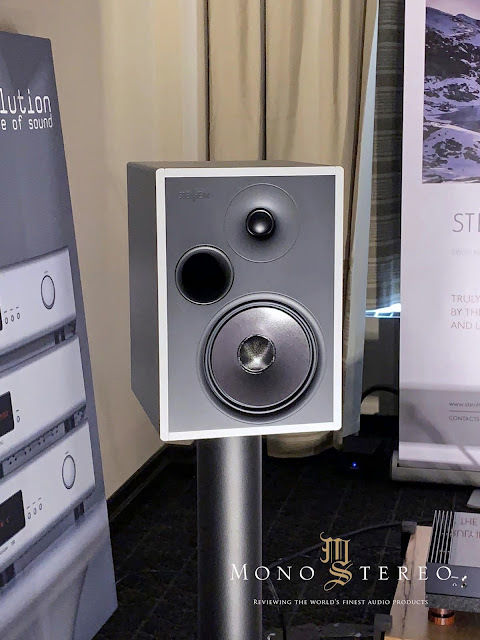 The Pulsars 2 are priced at $ 12,000/pr. 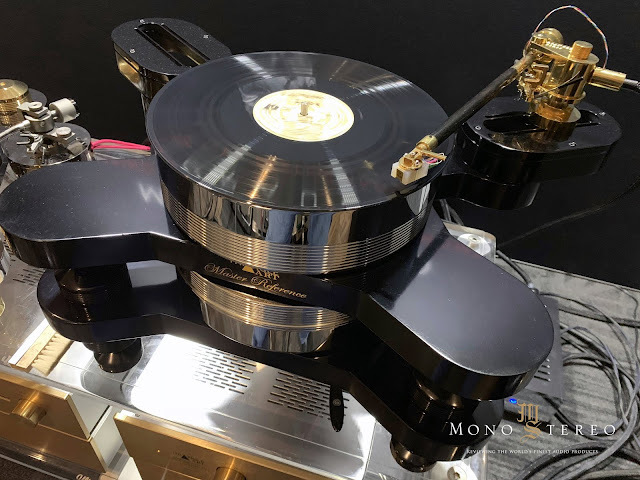 I spent more than half an hour in the room listening to the tunes on Living Stereo’s famous Music for Bang Baaroom and Harp album, and the VPI direct drive is primed for this this type of music! 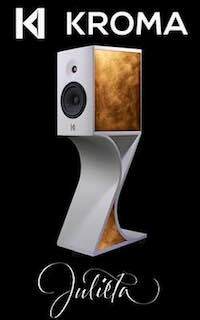 The top of the line Martin Logan “Neolith” speakers, powered by a stack of Simaudio equipment strikes a sonic impression as unconstrained, and as imposing as it looks. 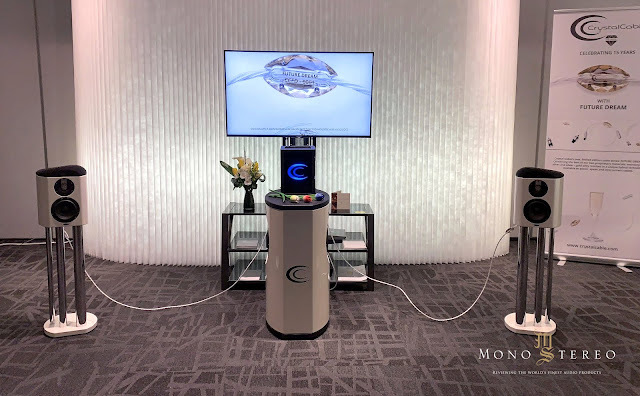 At US$ 79,995 a pair (CAD$ 105,000), the Neolith’s 48”x22” electrostatic panel delivers a transparent top end almost unrivaled by any speakers at the show, yet the bottom end of the “Neolith” is capable of going down to 23 Hz, thanks to the build in 15” and 12” high excursion bass drivers. Initially, I sat in the front row listening to Ensemble Clement Janequin & Domonique Visee’s “Voulez Ouyr Les Cris De Paris”. The soundstage was so deep and wide, that I had to move back nearly 12’ to the last row of seats in the room, which goes to show the level of sound pressure and soundstage the Neolith is capable of producing, they are best suited for a rather large room. I got drawn into the room by Led Zeppelin’s classic “A Whole Lotta Love”, in all its 1969 nostalgic glory. The room reminded me of a 1970s fraternity house party as the music was loud, the lighting was super dim and with a blue glow in the background. Not the best idea for show photography as the photos you see here required major photoshopping, but the sound is major rock’n’roll boogieing cool! 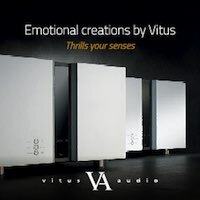 The 6th generation Oracle Delphi turntable, the CD1000 Mk III Transport, CD1000 Mk III Transport, and Turbo Mk II Power Supply are all familiar territory, but the EON Art Quark Amplifier and Venus Acoustics “Cybela Tall” speakers are names which I haven’t heard before - but they are love at first sight. EON Art Canada Inc is formed in 2017 when EON Art Haute Fidélité of Canada Venus Acoustics of France. 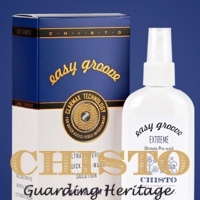 Both companies, however, has a much longer history, each with their own area of specialty. EON Art Canada has made substantial investment s into their R&D and manufacturing. They currently own the largest audio electronic lab in the Canada, with equipment requiring a space of over 3000 sq. ft. EON Art also has the largest scientific computer in eastern Quebec with more than 800 processors for electronic simulation and circuit optimization. These boys are serious about their business. 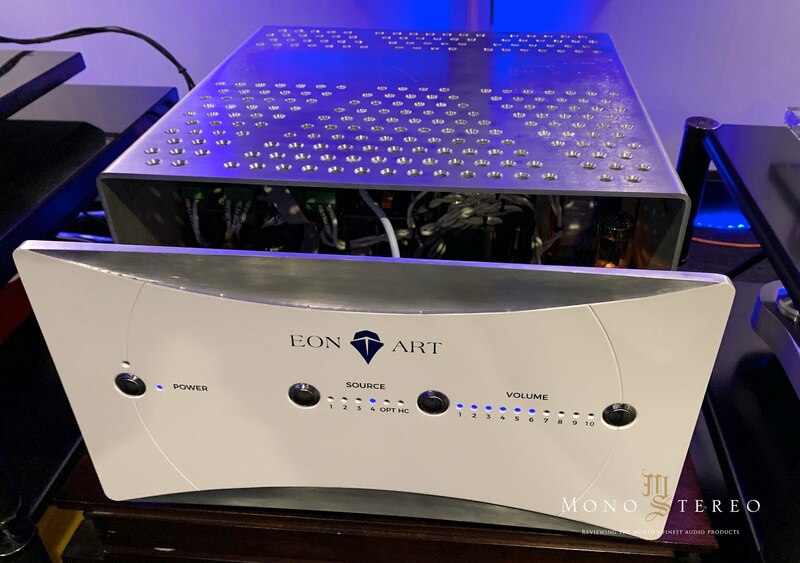 The EON Art Quart Amplifier is designed by Stéphane Hautcoeur, the only Class A+D integrated amplifier in the world which combines tube rectification and tube front end with a Class D amplification output topology. 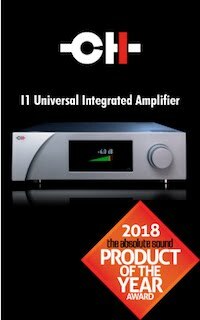 The Amplifier delivers 208W @ 8 ohms, and 332W @ 4 ohms - that’s plenty of juice for a hybrid integrated amplifier its size! 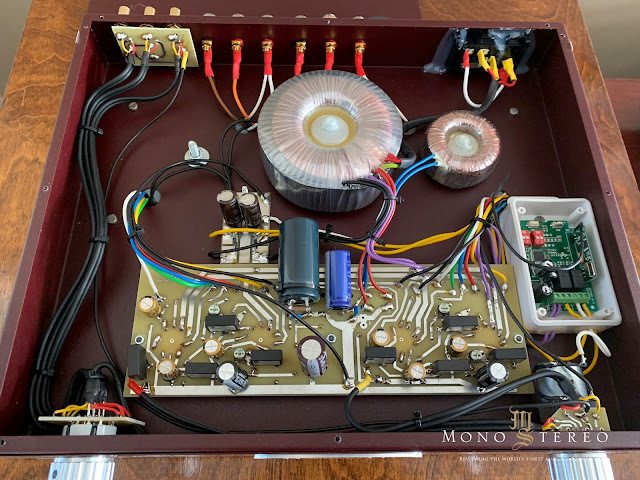 Hautcoeur recommends replacing all the electrolytic capacitors in the amplifier after 5 years of usage, but they have made the job easy as the capacitors are housed in a separate PCB. MSRP C$ 34,899.00. The amplifier comes with a 10 yr bumper to bumper warranty. The EON Art Venus originated from France, but the company is currently based in Chandler, Quebec. Designer Nicholas Dutriex holds three patents on the design in France. 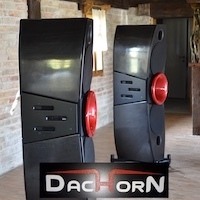 The speaker houses 2 x 26 cm, 2x 28cm Carbon Fiber Paper Cones, as well as 2 tweeters, one in front, and one at the rear. Both tweeters are adjustable on 2 axis. 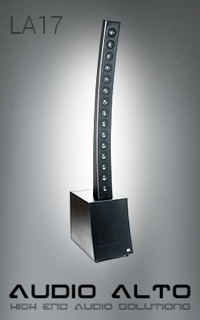 It is rated to handle 200W RMS with 91 dB sensitivity and 4-ohm impedance. They weigh in at a whopping 180kg per set. Warranty is 5 years. MSRP C$ 72,599. 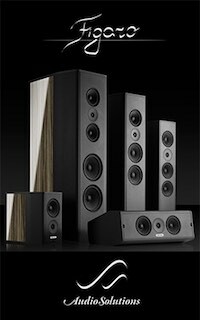 Vimberg, is a more affordable brand, brought to you by the same people who make the Tidal speakers. The Crystal “Future Dream” was being shown in Canada for the very first time. 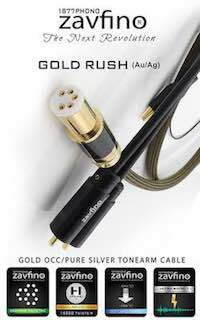 It is a limited edition cable combining mono-crystal silver and silver/gold alloy. 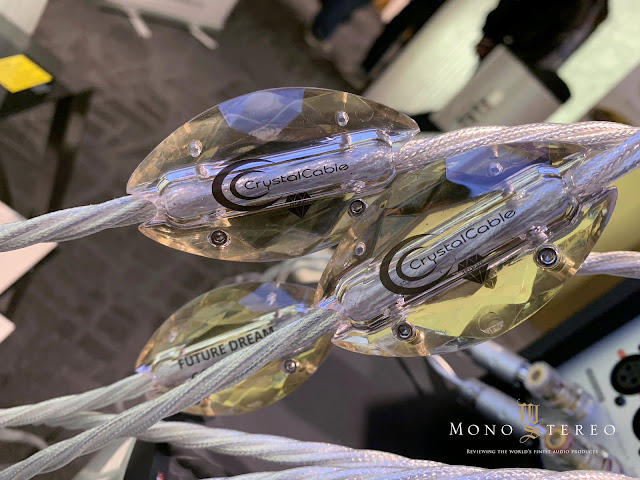 Crystal actually holds a patent on its proprietary metallurgical process that injects pure gold in between silver crystals which prevents the crystal from oxidizing. The proof is in the pudding, and the fact that it made me sat down for more than half an hour listening to tunes from Gabi Rijnveld’s own test CD called “Arabesque”(made by Chesky Records), tells you whatever potion they’ve cooked up, seems to be working. The sound was warm, inviting, and piano was life like. Later I found that Gabi Rijnveld herself actually played the Chopin's "Berceuse" OP 57 in the recording. Tom Vu, CEO of Triangle Art, created a lot of bling and buzz with his impressive array of Triangle Art equipment. Paired up with the Muraudio, they recreated a live performance of Hugh Masekela “Stimela (The Coal Train)”. The song needs to be played loud and that he did, to my utter satisfaction! 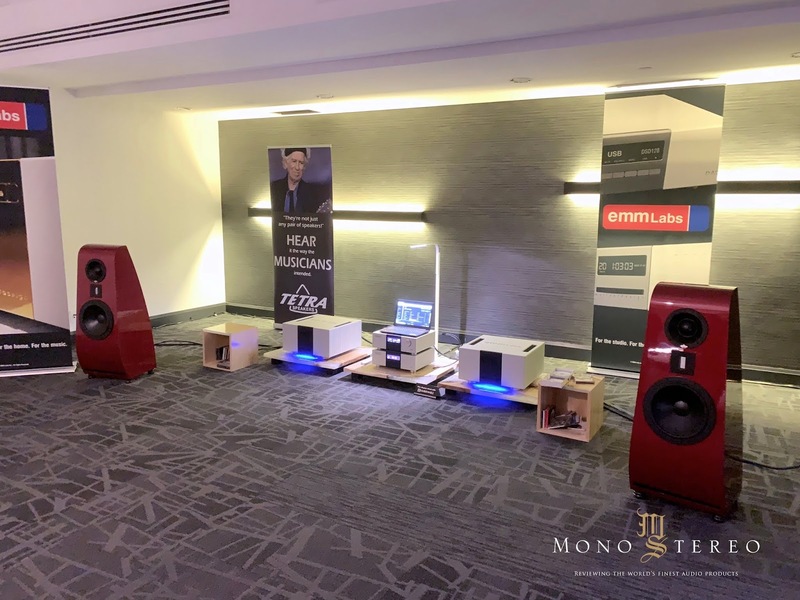 Even with the advantage of space, as Tom Vu occupied one of the largest rooms, the system would still need to be able to deliver a high level of sound pressure to fill the acoustic space. 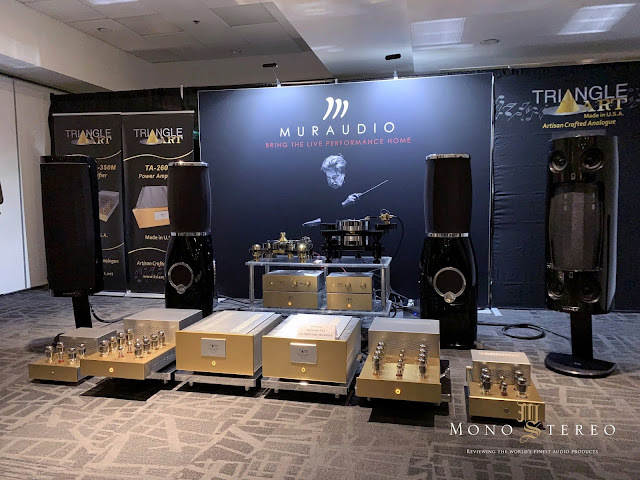 The bass was chest pounding and solid, the highs are transparent but not edgy, combined with the Muraudio, it was a match made in heaven, certainly one of my favorite setups of the entire show. I did fail the test on guessing which amp Tom Vu was playing, SS or Tubes, and they turned out to be solid states. The Master Reference turntable is pure eye candy, and I most certainly preferred it than the blingy gold version. According to Tom, there are only 2 in the world right now, and the first one went to one of my close friends in Asia. The second one is what you are seeing here, it was being shown for the very first time to the world. But of course, this is not a limited product and Tom will be happy to take your order, and if only I have an unlimited source of funds………. When I heard the Stenheim + CH Precision system at the 2018 Munich High-End show, the sound remains riveted into my mind. It is one of those iconic setups which lingers on and on long after show. 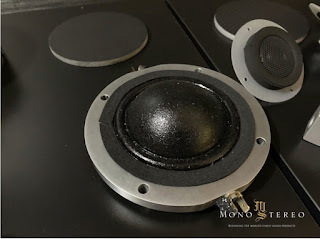 Jonathan Badov of Sonic Artistry put together a much smaller version of the Stenheim system, which is a wise thing to do. He chose the right speaker size for the room, any bigger and there would be uncontrollable bass issues which was a common problem with many of the other rooms at the show. - WOLF Audio Alpha 3 server $6,300 USD. 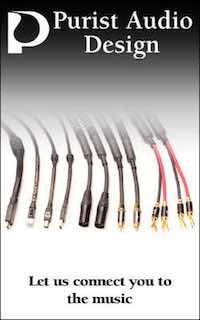 - BIS Audio Cables, VIVAT and Maestro II POWER CABLES. 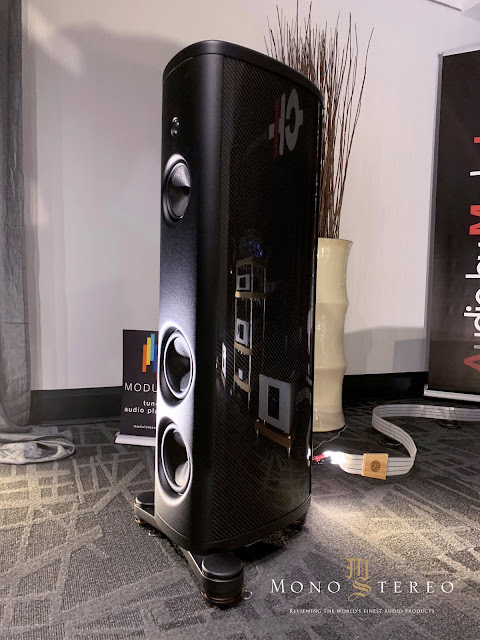 David Chan (VP of DVL Audio, distributor for CH Precision in Canada), Alex Gorouvein (Fellow writer), and Dr. Rami Habib (Greater Toronto Area Audiophile Club Member), all told me the Stenheim speakers pulled of the best imaging of the entire show. I had my doubts so I went back to the room a second time to have a second listen. They were right! Sitting in the right spot, the speaker disappeared on the backdrop of The Stimulators’ “Tumbao Bonito”. 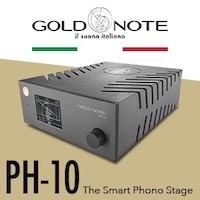 Soundstage, instrument size and location was precise, the sort of sound which will make non-audiophiles go “NOW, I KNOW WHAT THIS HIGH END STUFF IS ALL ABOUT!”, because that’s exactly what a parton said in the room. Alex Gorouvein insisted on playing the “Encounter at the Shrine” on the Seven Swords movie soundtrack by Kenji Kawai, which I thought is the audiophile version of “bullying” a system! The CD is a must buy if you are looking for music to shatter speakers or to clip an amplifier if you are not careful. I once blew the drivers on my speakers with this song when the woofer was literally ripped from their suspensions. It is not a recording for the faint of heart, and if it sounds bad on your system, trust me, it is not the recording. OK, earth's didn’t shatter with the little Stenheims, but considering their size, I heard some pretty deep bass on a backdrop of deep thumbling notes which filled the entire room. WOW, was all I said! 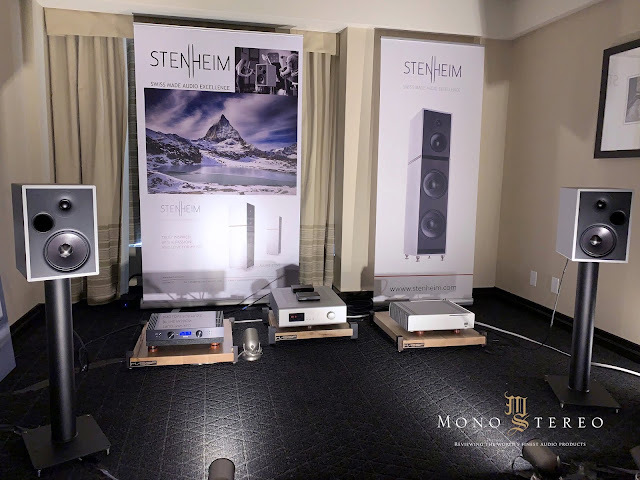 The Steinheims is being debuted for the very first time in Canada, and I look forward to hearing more of their larger sized models. Want to have a foretaste of the land flowing with milk and honey? 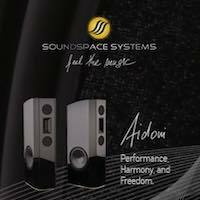 Give Jonathan Badov at Sonic Artistry a call, the Soulutions and Stenheims will not disappoint. 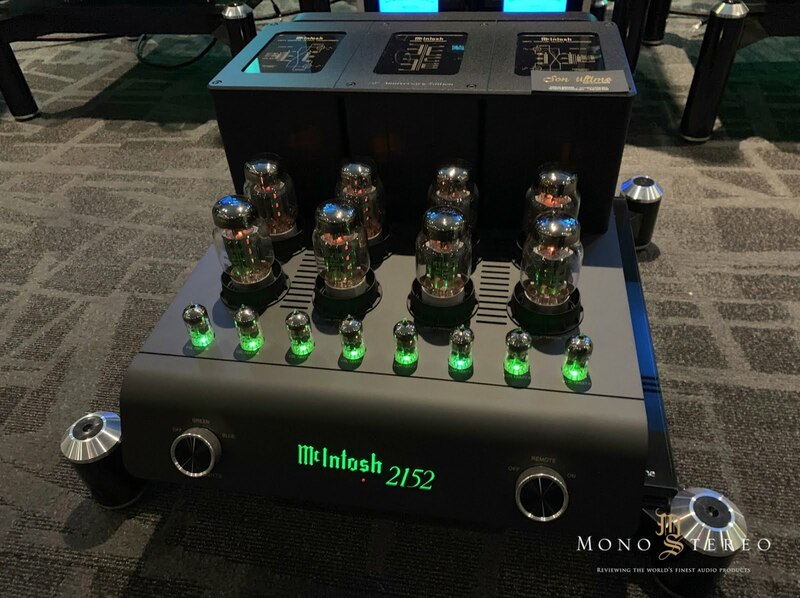 As a proud multi-generation customer of McIntosh since the day it was founded, our family are tried and true McIntosh fans, so the McIntosh room is a, must visit for me. 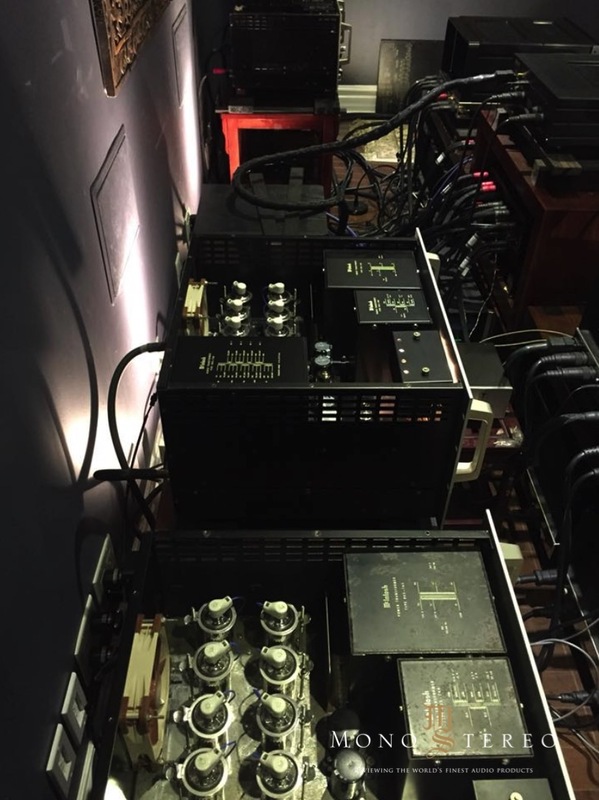 I’m quite proud to be the only person in the world (probably), who uses 4x vintage rebuilt MC3500 amplifiers to bi-amp, my speakers, pumping out nearly 1000W of tube power. When solid states are called for, I’ll switch over to the MC2KWs. So yes, I’m a Mac fanboy. I have been looking forward to listening all-new MC2152, McIntosh newest 8 x KT88 tube amp as part of their 70th Anniversary Limited Edition Commemorative System (US$ 22,000), which comes with the Mac book and the C70 Preamp. 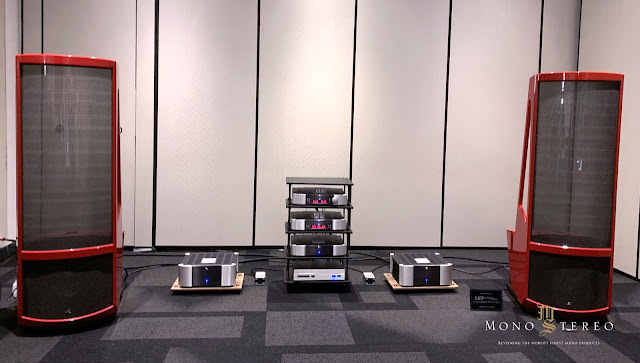 The C70 and MC2152 are also available separately at $ 7,000 and $ 15,000 respectively. The MC2152 has circuitry which is similar to the MC275, except it has double the number of power tubes which brings output to 2x 150W. My enthusiasm was curbed when I found out that the MC2152 was not hooked up, but just plugged in for static display. I was surprised to see the amplifier being left on without load (speaker connection), probably not the best idea for a tube amp but perhaps they have some safety tricks which I wasn’t aware of. The MC1.25KW was used to power a pair of O-So-Gorgeous Sonus Faber Amati, flagship of their Homage Tradition Collection. 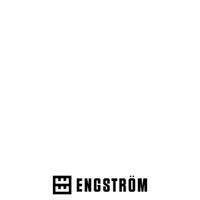 I listened to Han Theessink’s “St. James Infirmary” in its entirety. The sound was unmistakably McIntosh which I am so familiar with - a sound state sound which is almost like tubes - calm, relaxing, assured, and well controlled. Much better than the similar Mac setup at the 2018 Toronto Audio Fest which I found to be too boomy, probably caused by wrong speaker positioning. 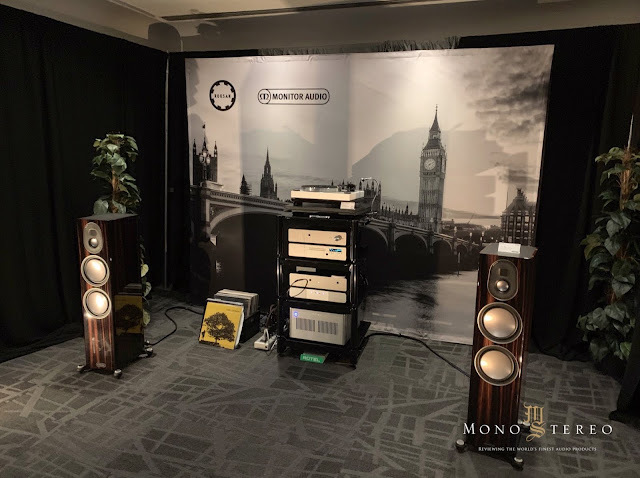 Son Ultime (Quebec McIntosh Dealer) has done a marvelous job of striking a well-balanced system which I can listen to for hours. 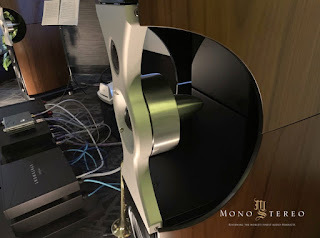 I must note that the sound carried a deeper low end than normal, thanks to Rel Acoustics’ 212/SE subwoofer (US$ 4,200). 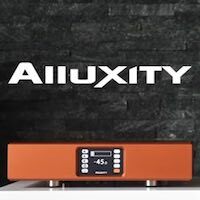 It houses 2 x 12” front firing active woofers, and 1 rear passive and 1 down firing passive woofer, the active drivers are powered by a 1000W build-in Class D Amplifier. 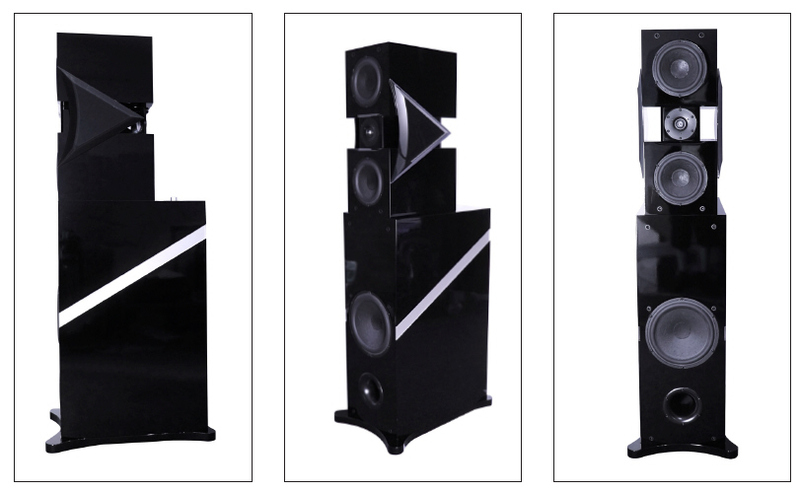 The added bass is something I would want for a home theatre setup, but for 2 channel, I’d still prefer the sound without the subwoofer. 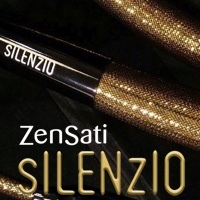 If there is an award to be handed out for the best “budget item” of the show, I’d give it to Fezz Audio. In our days when MSRPs are going up at a rate much faster than inflation or the return of my investment portfolio, it is a breath of fresh air to see prices that are more reasonable. 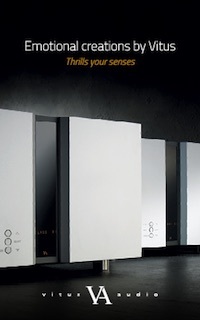 Fezz Audio is a Polish manufacturer of quality integrated tube amplifiers. 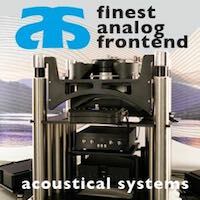 My AnalogMagik booth at the 2018 Munich Show happens to sit right across the Fezz Audio booth so my partner John Sokecki (Chief Engineer of AnalogMagik) and I had a nice long chat with the owner of the company. 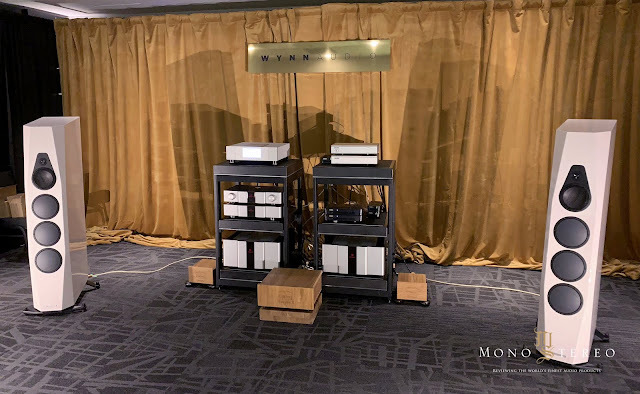 We purchased one of each of their amplifier on the spot, and I currently own their Alfa Lupi EL84 based tube amp, and their Mira Ceti 300B integrated amplifier, the exact amp which Tri-Cell was using to power the Odeon Audio Scala speaker ($ 11,000). 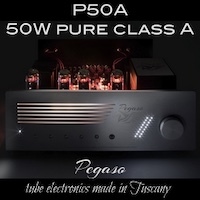 Read it carefully, that’s $ 3000 dollars for a 2x 45W KT88 based tube amplifier, in today’s market I was expecting something like $ 15,000, but thanks to Tri-Cell and Fezz Audio, young people can finally have a doorway to High-End audio. 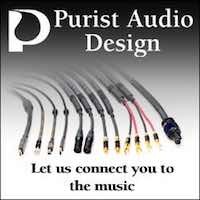 Make no mistake about it, do not think Fezz Audio is of low quality just because the prices are reasonable. Here’s the inside of my Alpha Lupi EL34. By the way, I broke the seal which says “Warranty Void if Seal Broken” to bring you this photo. So if my warranty is void, I’ll send the repair bill to Matek Isak if I ever run into a problem!! The toroidal transformers are wounded in Poland, and the circuitry work is on par with many amplifiers costing multiple times over. Highly recommended! 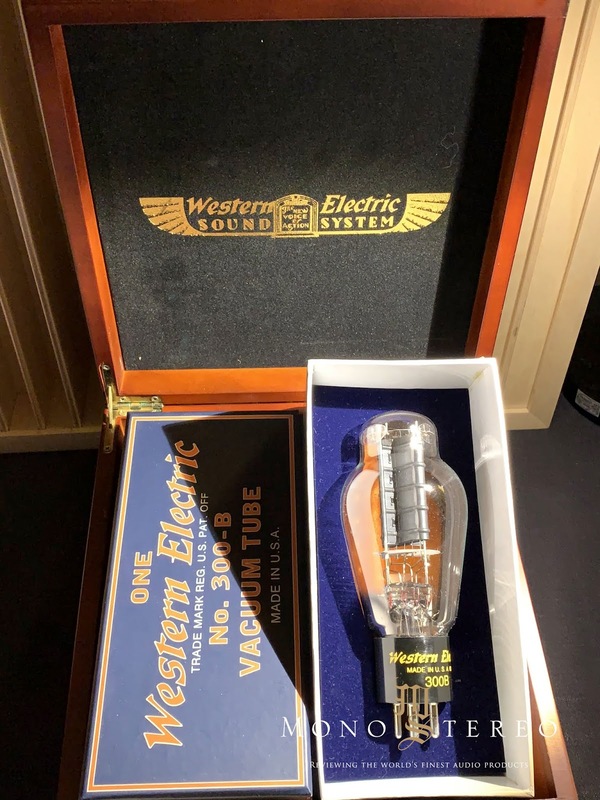 When my best friend passed away a few years ago, I was entrusted with the sell off a lot of 1950s original Western Electric 300B tubes. I remember selling several pairs for over $ 8,000 USD (set of 2). The iconic Western Electric has become insanely priced unobtainium. Will they be like the Mullard Reissues or Telefunken Reissues, whether the only resemblance to the original is the look of the box, or will they truly be a sonic reproduction of the age-old treasures? The judges are still out, but one thing is certain, very few reviewers in the world have the originals to make a direct comparison, and here’s my chance to get cocky - I still have a few pairs of 1950s original in my tube arsenal! 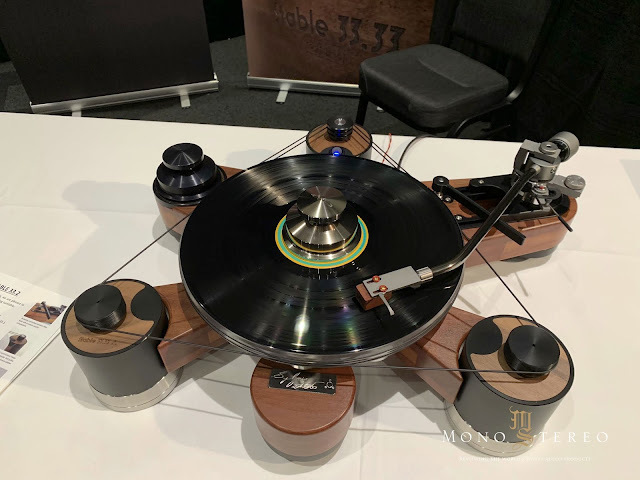 Stable 33.2 Turntable (C$ 12,000) - A new name to me at the show. 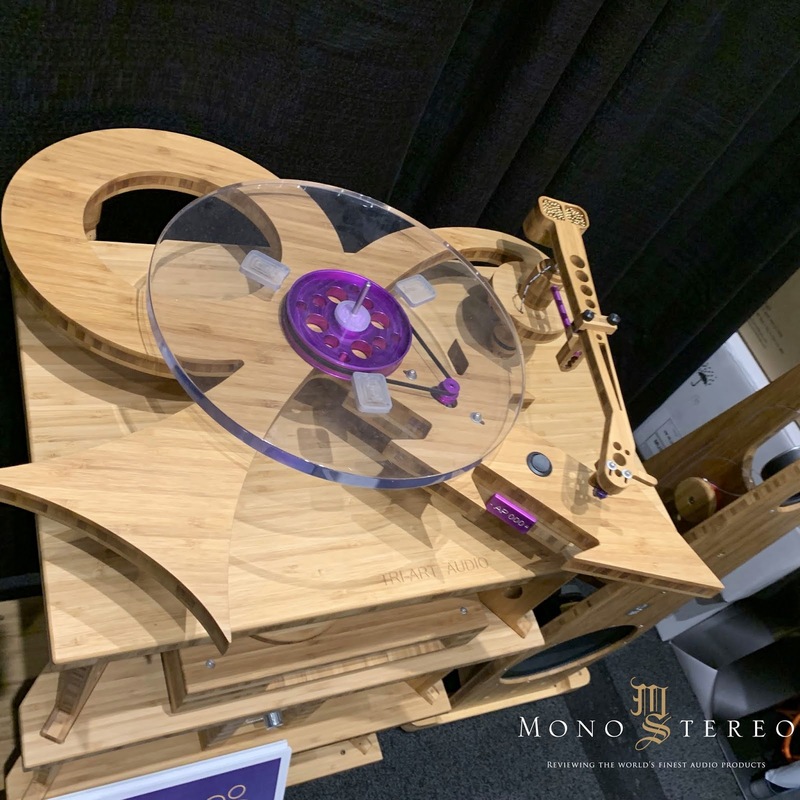 Tri-Art Audio’s turntable, this must be a “Prince” Commemorative design, very cool! I was not as diligent on the smaller hotel rooms on the main floor because the rooms were all very crowded, and ventilation was exceedingly bad. For every 4 rooms, I had to go for a break as it was almost suffocating in many of the overcrowded rooms. 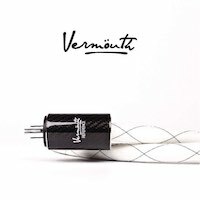 Overall, Montreal is my favorite audio show, it is small, intimate, well-run and professional. Combined with Montreal’s food, wine, dining, and cultures, makes for an excellent weekend getaway experience. Is there anything I do not like about the show? Not on the Montreal show itself, but the industry as a whole, with two notable alarming trends. 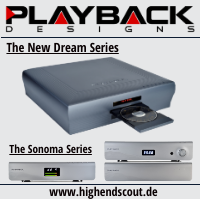 First is the rapidly aging population of audiophiles in an industry with very few new bloods in sight. I have been attending shows for the past 20 years, and I see many of the same faces over and over again, the only difference is that we are now all 20 years older. At the Montreal show, I see almost no teenagers or anyone under 30 years old. Any viable marketing strategy should incorporate demographics into the equation, the future of the industry paints a rather bleak picture for North America. With a shrinking and aging customer base, a short term strategy would be to raise MSRP to increase profit margin. With a constant supply of newly minted billionaires and multi-millionaires chasing after big names and big-ticket items, nearly all manufacturers are playing the numbers game so that billionaire customers can show off to their friends the million dollar systems which they own. 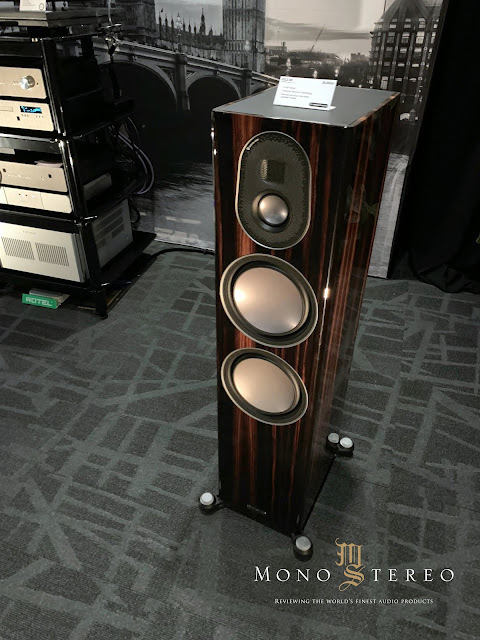 The only problem is, when a pair of speaker cost more than a car or in some ridiculous cases, more than a condo, something is severely wrong in the industry. How do we expect to attract young people? Assuming if you make more than $ 135,000 dollars in Canada, you will belong to the top 10% of income earners. At the Montreal Audio Fest, nearly 95% of the rooms have systems which cost more than a Tesla, which literally meant even the top% will have a hard time buying any of the items. You will need to be in the top 1% of income earners, so the best hope for us rat races will be to buy used equipment on Audiogon on Canuckaudiomart. 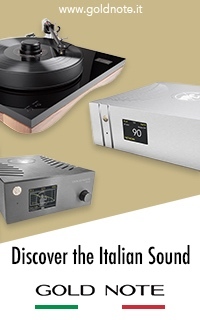 The market wasn’t like this in the 1980s, and shouldn’t be like this in 2019, which is why Fezz audio’s reasonable price tags have earned my praise at the show. 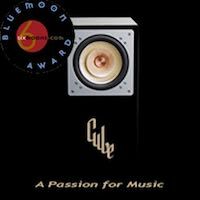 I have two teenagers in my family and they are very much aware of my social life in the audio world which encompasses not only audio but also music, wine, fine dining and a whole social experience which I believe in, advocate and actively promote in Toronto. 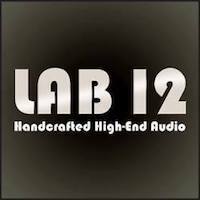 Audio should be fun, the image of some old gentleman, sitting in front of a chair with his eye closed, passing judgment on a piece of equipment alone in the room, is ……………. there’s nothing wrong with that, but it is boring, outdated, and not an experience which young people can afford, connect with or aspire to. I asked my daughter about what she thinks of audiophiles, she said: “Dad other than your crowd which is cool, the rest of them are old and boring and none of my friends understand them”. To me, audio is not just about music, it is much more than that. 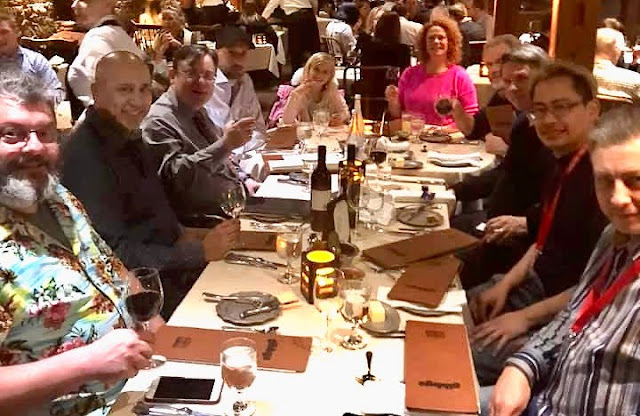 It is a social experience combined with the finer things in life which brings enjoyment out of friendship, fine wine, fine audio and music which soothes the soul. With that said, I look forward to my buddies coming over on Monday, to listen to the DS Audio Cartridge and Meryll Amplifiers which just came in for review. Until next time………….